Happy National Chocolate Pudding Day - hooray! 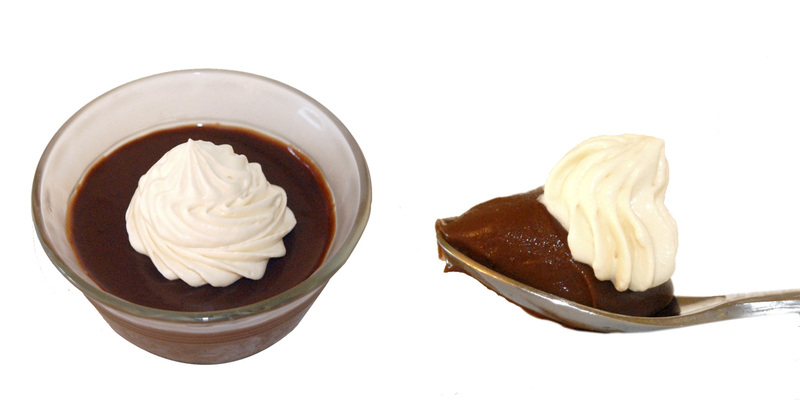 Pots de Creme: a French pudding, like a heavenly cross between custard and ganache, is just oh so good. The perfect celebratory treat for this festive day. *Many pots de creme are cooked in a water bath in the oven. This recipe is finished on the stove. The results are great - very silky smooth, and never under or over cooked! 1. Get ready eight 5 oz ramekins (I used slightly larger glass bowls). Set aside. 2. For the Pots de Creme: place the chocolate in a medium bowl (a pourable bowl is best). Microwave until nearly melted. Place a medium-sized fine mesh strainer over the bowl. Set aside. 3. Whisk the yolks, sugar, salt, and syrup together in a medium bowl. Whisk in the cream. Pour the mixture into a medium saucepan. 4. Set the pan over medium-low heat. Cook, stirring constantly, until the mixture reaches 175°-180°. Do not allow the mixture to come to a simmer. 5. Pour the mixture through the strainer, over the chocolate. Remove the strainer and allow the mixture to sit for five minutes (this will give the chocolate time to melt completely). 6. Whisk the mixture until smooth. Whisk in the vanilla extract and the maple flavoring. 7. Divide the mixture between the ramekins. Tap each ramekin gently on the counter to remove any air bubbles. Allow the pots de creme to come to room temperature. 8. Cover and chill the pots de creme until cold and set - about four hours. 9. For the Maple Cream: combine the gelatin and water in a small bowl. Let sit for five minutes (so the gelatin can fully absorb the water). 10. Microwave the gelatin until it is just dissolved (about 10-20 seconds). Set aside. 11. Meanwhile, combine the cream and syrup in the bowl of a stand mixer (this works best if you chill the cream, bowl, and whisk briefly in the freezer beforehand). Whisk the mixture until it has thickened - almost to soft peaks. 12. Turn off the mixer. Quickly add the gelatin mixture. Quickly turn the mixer back on high to incorporate the gelatin (speed prevents the gelatin from clumping). Whisk to stiff peaks. 13. Serve the pots de creme topped with the maple cream. Enjoy!